37 comments to ''PPDT Story on a Person Sitting Near his ill Mother: Practice Set 8"
Deepak you are really giving wonderfull ideas about PPDT. I am also an aspirant of SSB. So if u can upload some more pictures with sample stories then it will be very helpfull. heyy deepak my question is would it be right to give a moral to the story too...? ramesh 20 years old,has a great news for his ill mother.his mother mrs sushma is suffering very badly because of one of her failed kidney.she has lost all her hope in getting a right donor.but ramesh along with his friends did something which was really commendable.ramesh deployed his friends efforts and his intelligence in a perfect way.he got one donor .the operation was succesful and ramesh and his family lived happily ever after. Words doesn't come into my mind immediately for making good story. How it can be improved..bro ?? 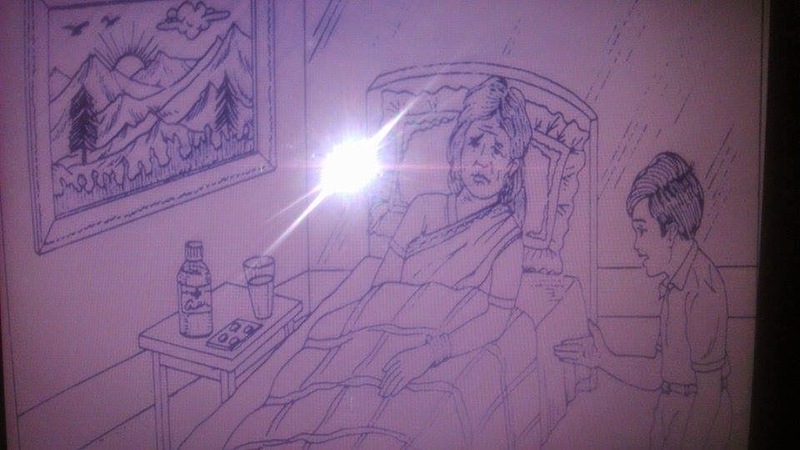 The picture depicts a young boy at his adolesence named ram and an old woman kamla who happens to be the grand mother of ram.kamla recently met with an accident and lost her eye sight completely and knowing this fact she gives up to the situation by not consuming her medicine on time but her grandson takes the responsibility of cheering her by daily narrating his experiences to her and reminding her the reason to live ,as a result of his commited efforts she gets well ,she might have lost her eyesight but she has won her grandson. Rohit was doing his masters in city.As his father was a farmer,So he use to take tuition in his area for his daily expense rather than asking his parent.Once he went to take tuition class on one of his student house.Where he found that student's mother was not well and his father was out of town.He took responsibility to took after his mom till she get well or father comes.He took her to hospital and checked with doctor.He stayed in his house for next two days and took after everything.He cooked food for her ,provided medicine on time.Student's father arrived after two day and he was really thanks to rohit for his care and undersatnding.Student mother recovered soon. 1.For womens they didn mention weight i am nearly 42kg in weight ,is this ok for ssb observer? It was a pleasant Sunday morning when Ramu actively woke up from bed at 5:30 am,just as the ball kicked by him squeezed through keeper's hand. "I shall make this dream real today" he thought and quickly finished his nature's calls. He came out of room and noticed that kitchen light is switched off. Ramu quickly rushed to his mother's room and felt sad finding his mother very ill. He started serving his mother when Mrs. Leelavati, his mother, said "it is a simple fever because of fatigue you go and play. "But Ramu knew she needs care,so he made sure she took her tablets and food while giving Mrs. Leelavati homely company till the end of the day. Mrs. Leelavati recovered to a good state and appreciated her son saying "I am proud of you my son". Saket is a 14 year old boy. He lived in a village dharampur of UP with his parents.his mother is suffering from dengue. Saket has seen lots of advertisement on national tv about dengue- how it spread, how it can be prevented, what should do to cure it etc. He immidiately understands that his mother is ill just because of their unhealthy environment. He called his friends and started cleaning the village. He put all the garbage at one place , pour kerosene oil in all the drains and sewage pipes. He put all the waste utensils upside down so that water doesnt filld into them. He also went to every house of the village with his friends to aware the people about dengue. He also took care of his mother. His mother cured in one week. And dengue doesn't spread to anyone else latter. Saket was awarded by the cm of state for his this nobel work. Nitin is a student of 10th class and lives in a village with his mother.His mother is ill from a month now and he is been serving his every responsibility towards her mom and also took his boards exam in this situation.With his great effort his mom is revering now and Today his reults are out and with his stern will and effort he topped his village and he comes to his mother and inform her about the result after which his mother feel really proud of him. Ramesh along with his mother stay together as his father passed away recently and just few days back he noticed that his mother is suffering from prolonged cough and when consulted by a doctor turned out to be TB,which is very serious.As they couldn't afford a nurse he devoted himself to care of his mother by fetching medicine also supporting her in every way.He takes one week leave from his school. Raj, who studies in class 8th, lives in New Delhi with his father and mother. He is quite sluggish towards the academic studies. Once his father had a business trip to Bangalore lasting about a week. In the meanwhile his mother got injured badly because of slippage from stairs. Raj called up their family doctor who prescribed an essential rest of 5 days with regular dosage of medicine. Unfortunately he had his Maths class test upcoming next week. He thought for a moment and prepared the schedule accordingly. While looking after his mom, he practiced the class notes. Next week,till his father came back,his mother got well. Due to his consistency to the schedule, he topped in the class test too. After that instance, views of every single person complaining about him, changed into appreciation. hi ,i am shortlisted for ssb i have called to coumbotor. but i my weight is 40kg that not fit to my height according to BMR then what can i do. rahul is a 12 year old boy.his mother is sick as she is suffering from fever since 2 days.she is sad as she cant do household chores and cook food for his son properly.but ram is sits besides her bed and consoles her that she will be fine till tomorrow as he has given her those medicines . and he shows her the picture hanging on wall and says that when she will be fine they both will go to watch the hills. her mother recovers the other day and they both go to watch the scenery. Sumit was class 11 student. Sumit with his friends planned for a picnic to nearby village. It was sunday morning. He woke early morning and make ready himself for picnic with all necessities. He went to his mother room for asking to leave . While step touch he observed his mother is not well. He called his friends to go picnic, he will join later. He gave medicine and prepared meal for her mother. Her mother became well and asked her son to go for picnic. Sumit went to picnic and enjoyed there and came back to home early evening. Jitu Ganesh was 12 year old boy.His lives with his grand mother. For the past few days she feels ill and depressed thinking about his future. He understand her illness and mental stress. So he took care of her and also talks with her about the school incidents his teacher care about him. And his studies and his clear ambition.By hearing this his grandma got felt good as he is feeling happy with people around him.And she felt proud for his clear ambition. she recovered soon. And they had regular life as usual. Ram is a ten year boyschool going boy.He goes to school regularly for two days he was not going to school because his mother is ill and given complete bed rest for two days.R am took care of his mother cooked food for her,gave medicine on time.Due to his efforts she recovered soon and was happy to see her child doing so much care of his mother. harsha was studied 9 th standard in st marrys school, one day his mother was fallen to sick after seeing his mothe r situation he decided to take care of his mothe r . he has take a permsisoon from clas teacher .. and he gave a time to medicene and gave some healthy food .he mmother was recovered after a weak ,and harsha is also continued his school, harsha mothe r was very happy with his caring and havimg a son like harsha, thanking you. Raju is a student of class 9th, he was at school and when he came to know that his grand mother is admitted to hospital due to illness, he suddenly came to hospital with his father and asked his grand mother for her health and her grand mother was happy and going to get well after knowing that his grand son cares too much for her. Shyam is a school student who is studying in 6th standard at Maharishi Vidyala in Dehradun. His father is an IT professional who is working in a Multinational Corporation in Mumbai. His father's name is Sundaram. He has a busy schedule and his son Shyam studies in Dehradun. He had landed in for a business meeting in Dehradun. But due to lack of time, he was never getting time to meet his old mother, Rani. But Shyam took up the responsibility of taking care of her grandmother, after school got over. Everyday he used to walk 2 km to take care of her grandmother who was admitted in the hospital. He used to study hard till midnight and always took blessings from her grandmother. His father was proud of him. One day Sundaram visited his mother and said that he had retired and wouls shift to Dehradun permanently. She bursted with tears and also Shyam said that he had topped school. She could not say anything but cry with joy and she felt she is very lucky to have such a wise family.